Todd Greiner runs Michigan’s largest asparagus packing operation – a facility that supports more than a dozen other growers in the region. But Todd Greiner Farms wasn’t built in a day. Greiner bought his first farm, a 120-acre operation that had some asparagus but was mostly dedicated to tart cherries. Since that time, blessings have accumulated around him in West Michigan’s Oceana County. He married his high school sweetheart, Sarah, in 1997. They have continued to expand and diversify their farming operations since that time, most notably buying his father’s farm in 2012. Today, the family farm is more than 2,000 acres and grows a spread of produce, including zucchini, sweet corn, peaches, butternut squash, spaghetti squash, acorn squash, buttercup squash, apples, heirloom pumpkins and jack-o-lantern pumpkins. But asparagus has been a focus of their growth – Greiner appreciates the Sequoia, Eclipse and Millennium varieties. His packing operation has grown at the same time. In the 18 years that he’s spent packing asparagus, Todd Greiner Farms has ramped up its packing volume from 80,000 pounds to 4 million pounds. The company recently completed a 20,000-square-foot addition to its packinghouse. The expansion, which is the company’s second in the last 12 months, includes two new controlled-atmosphere cold storage rooms and two new shipping and receiving docks. The expansion also simplified the packing operation. “We had been packing in two facilities,” said Sarah Greiner, who is also the secretary/treasurer of the Michigan Asparagus Advisory Board. Todd Greiner Farms packs for 14 other Michigan asparagus growers in the northwest region of Michigan’s Lower Peninsula. 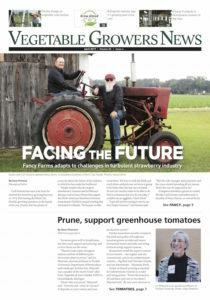 The goods are marketed under the Todd Greiner Farms label, but their efforts to pack and sell Michigan asparagus are appreciated by their colleagues. The Michigan asparagus season typically runs from early May to late June. In addition to its locally grown, domestic pedigree, Michigan asparagus is also known for being hand-snapped versus ground cut. The result of this harvesting technique is an all-green, all-edible spear, which Michigan growers say adds shelf appeal and more total yield per spear. With access to eastern markets, Michigan growers are able to sell asparagus for both fresh sales and processing. “Fresh is a good, healthy 50 percent of Michigan production,” Todd said. Microwave bags of fresh asparagus were introduced to markets this year after a trial run in 2017. His production line was at capacity in 2017, but there was the prospect of additional business, and existing customers were also asking for more. Now, with the new processing line, the group has a new option for selling fresh. An important addition to the expansion is a new “flow-wrap style” bagging line that will initially package fresh asparagus into new 16-ounce bags. “We always wanted to come up with a new product that was consumer-friendly, and try to move more Michigan asparagus and try to make it easier for the consumers, and quicker,” Todd Greiner said. The microwave bags were introduced at first with hand-packing in 2017 to meet a consumer trend for quick and easy meal solutions. After 2-3 minutes in the microwave, the spears are cooked and ready for eating. The bags feature branding with a photo of Todd, Sarah and their children. Customers already have written to the farm with their compliments. “We have received quite a bit of positive feedback from the consumers themselves who have bought it this season,” she said. While Todd and Sarah have their photo on the package, they’re the first to tell visitors that they heavily rely on their excellent employees, and many seasonal workers who return year after year. The farm began using the H-2A visa program in 2015.